On March 30, 2010, three teenagers were shot to death while hanging out in front of an abandoned, 4-unit apartment building at 4022 South Capitol Street SE. Last week, five men were convicted of murder for their involvement in the string of events that culminated in the deadly attack. The fact that the victims had been gathered on the stoop of, and presumably at some point inside of, a vacant and unsecured building neglected by its owner has nothing to do with why they were killed. But that this was the setting of the worst massacre in recent District history is symbolic: the scene represented the intersection of decades of disinvestment in both people and place. The disinvestment in the young men who perpetrated the attacks, their families and the institutions responsible for forming them is the truly devastating issue here. However, this post will focus only on the disinvestment in the built environment - itself the cumulative result of numerous systemic forces (see White Flight, Black Flight, Redlining, Blockbusting, Wage Stagnation, etc.) 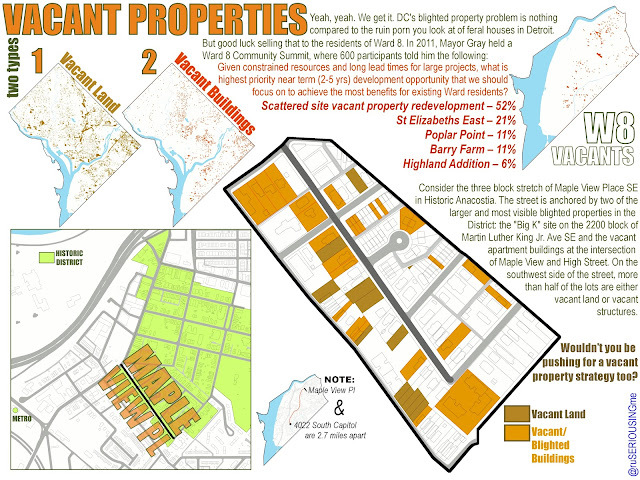 - and some of the current challenges that impede reinvestment in neighborhoods like this one. There are 2,232 addresses on the Department of Consumer and Regulatory Affairs' (DCRA) vacant and blighted properties list, the principal data source for the maps above. The list includes 4022 South Capitol Street as well as the two apartment buildings immediately adjacent to it. These are not normal short term vacancies, simply between leases. They are the buildings that are unleasable in their current state of disrepair. Some are bank owned, some are city owned. Some have absentee owners, some have local owners who live in poverty and have no means with which to fix up their assets. In some cases, the owner listed on the title is deceased and there are multiple heirs to the property. Many require a significant investment of time and money before they can again be occupied. The purpose of DCRA's list is to identify targets for the District's first line of defense against dilapidated buildings: taxation. By threatening to raise property taxes to 5% for vacant properties and 10% for blighted properties, the city encourages the owner to either bring the property up to code or sell it to someone who will, probably at a price less than what the owner would otherwise be willing to accept. Ultimately, if the owner neither takes action nor pays the elevated taxes, the property goes to tax sale and is awarded to the highest bidder. If no one bids, ownership rights go to the city, but that doesn't mean that a fresh title magically appears in the name of the District of Columbia. The District, like any other winning bidder, must first go through foreclosure proceedings, sorting through existing liens on the property and attempting to resolve any other title issues that exist. In other words, no one, least of all the District government, wants it to get to that point. This approach is a relatively new, boutique initiative that seems to have promise.To better understand how the program works, you've gotta read Lydia DePillis' narrative and analysis. Acquisition Cost - the cost of purchasing the property, which may include substantial legal fees, and interest or investor payments on borrowed money. Redevelopment Cost - site preparation (potentially including demolition), design and construction costs, interim maintenance and taxes, debt payments. Income from the Redeveloped Property - the income that the property generates once it is redeveloped and operational, whether in the form of net operating income if the owner chooses to lease it out, or income from the sale of the property minus any costs associated with the sale. For redevelopment to make sense, the sum of the first two variables must be less than the third, and when it doesn't, the free market won't mitigate vacant properties and blight. The first two solutions presented require a direct taxpayer subsidy - is it justified? It is easier to quantify the costs associated with rehabilitating blighted properties than it is to quantify the benefits. The broken windows theory suggests that blight can encourage and support illegal activities, but it is difficult to measure to what extent that is the case. Blight may lower surrounding property values and deter new investment. It can also contribute to the stigmatization of a neighborhood if dilapidated properties are seen as representative of the entire community. Across the country, the consensus seems to be that investing public funds in individual nuisance properties in order to battle the negative effects of disinvestment is a worthy cause. 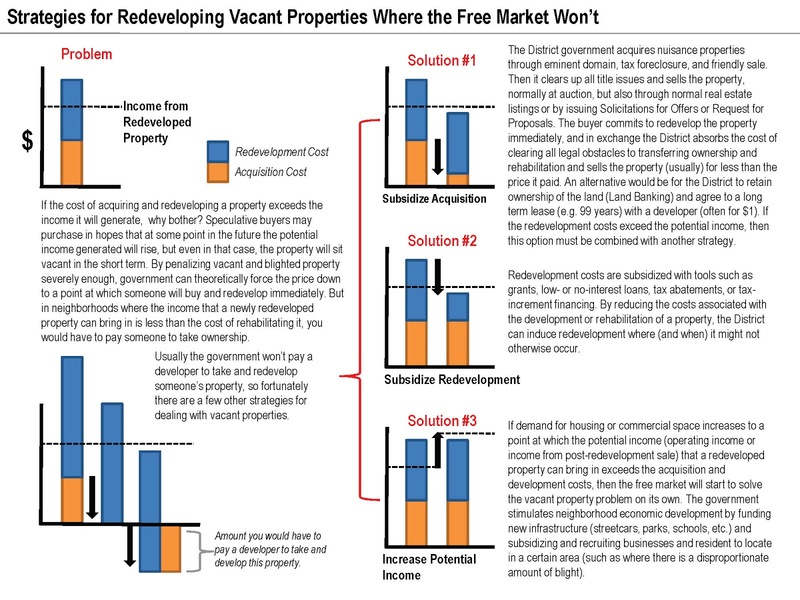 The Gray Administration, like previous administrations, uses a combination of the three strategies discussed in the previous graphic to combat long-term vacancy and blight, though there seems to be an intentional focus on Solution #3. Dedicating a greater share of energy, resources and talking points to large scale economic development projects, which in Ward 8 tend to revolve around St. Elizabeths, is certainly a more glamorous approach and it probably will have a greater impact on the District's bottom line in the long run. However, it is interesting that there has not been a more coordinated, ambitious, or heavily-funded government proposal for dealing directly with vacant and blighted properties in the parts of the District where they are most concentrated. After all, this is the topic that Ward 8 residents ranked as their top development-related priority at the Ward 8 Community Summit, and unfortunately it is an issue that will forever be intertwined with the tragic events that occurred two years ago at 4022 South Capitol St SE.